A NASA research plane, with the agency’s science director onboard, will fly out of Boeing Field in Seattle on Monday, Aug. 21, to capture the first video of the total solar eclipse as it sweeps ashore at the Oregon coast. “We’re kicking off the show,” said Leslie Williams, spokeswoman for NASA’s Armstrong Flight Research Center in Southern California, where the plane is based. The video will be part of a livestream on NASA TV that tracks the eclipse along its 2,500-mile path from Oregon to South Carolina. NASA officials, including science director Thomas Zurbuchen, will discuss the eclipse and answer questions from the public at the Museum of Flight. The museum will also host a public viewing of the partial eclipse that will be visible in Seattle, with free eclipse glasses for the first 1,000 visitors. Seattle was selected for the mission because of its location and the opportunity to collaborate on public outreach with the Museum of Flight, which sits right on Boeing Field, said Ted Huetter, the museum’s public-relations manager. “We have a parking spot right next to our fence,” he said. 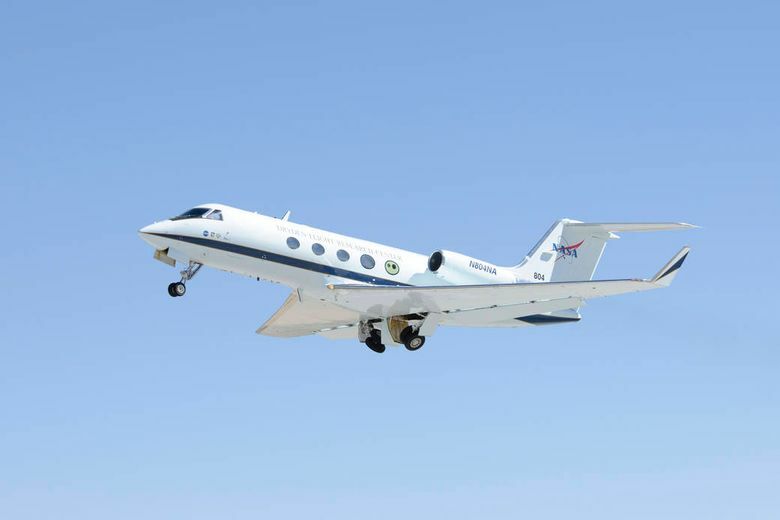 The NASA Gulfstream III, a large corporate jet modified for science, is part of a constellation of aircraft and satellites and an army of professional and citizen scientists that will be studying the first total solar eclipse in 99 years to cross the country from coast to coast. The jet will land in Seattle around noon on Sunday, Aug. 20. On eclipse day, it will take off early and fly to Lincoln City, Oregon, said pilot Troy Asher. There, the aircraft will repeatedly fly a north-south loop, giving camera operators a front-row view as the moon blocks the sun and the shadow begins to race across the continent. To improve video clarity, crews replaced two of the plane’s windows with optical-quality glass, Asher said. Shooting out of the windows, videographers and photographers will document the eclipse from beginning to totality in that location. “They will be able to see it develop, from fingernail sliver to fully covered,” Asher said. In Lincoln City, the eclipse will start at 9:04 a.m. Totality will begin at 10:16 a.m. and last not quite two minutes. While the videographers are at work, Zurbuchen will be operating a handheld spectrometer to analyze the sun’s chromosphere and corona — the wispy, outer atmosphere that is visible only during a total eclipse. Flying at 25,000 feet, the jet should be well above any clouds. If necessary, it can climb as high as 45,000 feet, Asher said. But the plane won’t be able to chase the eclipse across the country — because it’s not fast enough. The moon’s shadow will be zipping eastward at more than 2,400 mph, Asher pointed out. At the Museum of Flight, staff and NASA officials will guide visitors through a free public viewing event on the lawn from 9:30 to 10:30 a.m. Aug. 21. The eclipse will not reach totality in Seattle, but about 92 percent of the sun’s surface will be covered by the moon. The partial eclipse will start in Seattle at 9:09 a.m., reach its maximum extent at 10:21 a.m. and be over by 11:39 a.m. Paid visitors will be able to watch NASA’s live video of the total eclipse in the museum auditorium. After the plane returns to Boeing Field at around 12:30 p.m., Zurbuchen will also be available to answer questions. It’s unsafe to watch any portion of a partial solar eclipse without eclipse glasses or a pinhole projector. The only time it’s OK to look directly at the sun without eye protection is during the brief period of totality, when the sun is completely blocked by the moon. 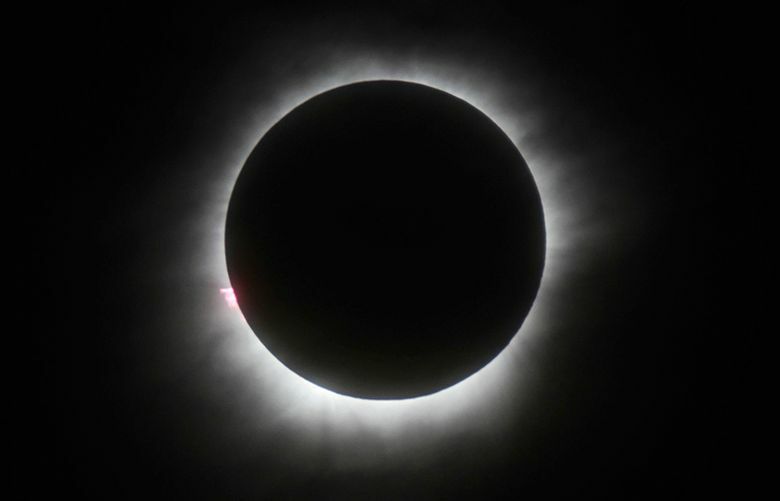 But totality will occur only in a narrow swath of the U.S. stretching from Oregon to South Carolina.